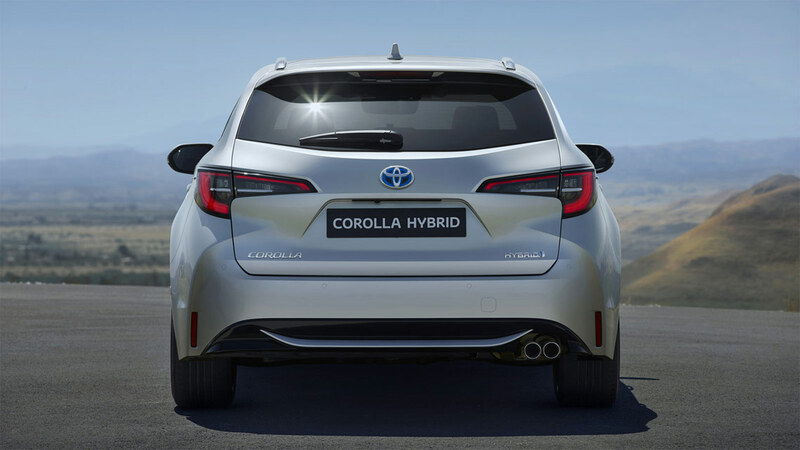 As the agile Corolla Hatchback and the versatile Corolla Touring Sports join the refined Corolla Sedan, the most popular car of all time widens it’s offering – while also being reimagined as hybrid. So whatever your lifestyle and whichever body type you choose, you'll benefit from self-charging hybrid powertrains, plus the reliability for which Toyota is renowned. Stylish, efficient and a joy to drive, this is the new Corolla: an icon for the modern age. With the new Corolla Hybrid, you will enjoy excellent fuel efficiency alongside super-low emissions – which fall to zero when you drive on electric power alone. With more major cities introducing low-emission regulations, you’ll be free to drive wherever you want to. Spirited and responsive in the city, the 1.8 litre Hybrid engine provides a smooth, relaxed drive. For the first time, both Corolla Hatchback and Corolla Touring Sports are available with a new 2.0 litre Hybrid Dynamic Force engine delivering even more power. Whichever you choose, you’ll enjoy an engaging yet economical experience, whatever the driving situation. And because Corolla is self-charging, you’ll never even need to plug it in. When driving is this satisfying, it’s the perfect time to join over 12 million people – including two million here in Europe – in choosing Toyota Hybrid. It’s just one of the reasons why, more than four decades after its launch, Corolla remains the world’s favourite car. Corolla is built on Toyota’s advanced new TNGA engineering platform, delivering a truly satisfying drive. A more rigid body and low centre of gravity come together to reduce body roll when cornering, while the double wishbone suspension absorbs shocks more effectively, for a smoother ride. Even the driving position has been optimised, to help cut down fatigue on long journeys. The new Corolla is a car that can take everyone everywhere, in both comfort and style. The Corolla Hatchback looks bold and dynamic. Its wide front and low bonnet give it a streamlined look, which is enhanced by a set of sporty 18" alloy wheels, a wide, striking grille and distinctive all-LED headlamps. The Corolla Touring Sports delivers a sleek look, but also adds extra space, exactly where you need it. Whether you need to carry a couple of bags or the whole family’s luggage, its generous boot space will fit everything in, thanks to an adjustable deck board and easily folded seats. Stylish and practical, the Corolla Sedan is characterised by refined lines which flow from the low nose to its spacious boot. It also shares the wide stance of the rest of the Corolla range. This is a Corolla that will make an impression, wherever you choose to drive. Crucially, Toyota Safety Sense is standard across every Corolla, because your safety is essential – never an afterthought. This unique safety system includes an array of updated safety features that makes driving easier, while keeping you and your passengers even safer. From informing you of potential hazards to actually helping to avoid them, this essential technology takes safety to the next level. Wider to Toyota Safety Sense is a range of intelligent driver aids that ensure every journey is as easy as it is enjoyable. For instance, the rear-view camera, Blind Spot Monitor and Rear Cross Traffic Alert make sure that you and your passengers are safer and more relaxed than ever before. Toyota Safety Sense has been updated to include Cyclist Detection and Night-time Pedestrian Detection. The system combines a camera with radar technology to detect cyclists and other vehicles on the road, while the update also allows pedestrians to be detected in low light. When the possibility of collision is realised, the driver is alerted with audio and visual warnings. If the driver doesn’t react, the brakes engage automatically. Even if the driver applies the brakes, the system contributes additional braking pressure to prevent or mitigate collision. Toyota at Paris Motor Show 2018 As the automotive industry enters a once-in-a-century transformation, Toyota has started a shift from being a pure car company towards becoming an overall mobility company – offering ever better mobility for all Toyota Touch® 2 - How-to videos Whether you own a Toyota equipped with Toyota Touch®2 or would like to see what our multimedia system has to offer, we want you to get the very best out of our in-car technology. An exciting new era for Corolla Next-generation Auris officially renamed Corolla. Toyota at the 2018 Geneva Motor Show After 20 years of hybrid leadership, we are committed to make Toyota hybrid ever more attractive to our customers. Toyota Corolla turns 50 In 1966 Toyota was readying a historic launch – the new Corolla. Today, as the world’s most popular car with over 40 million sales, Corolla reaches another incredible landmark: 50 years of production. Recall As part of Toyota’s commitment to quality and safety, Toyota is expanding these recalls involving certain Takata airbag inflators in Toyota. At Toyota, the safety of our customers is our number one priority, which is why we continually monitor the performance of our vehicles through a number of sources. If we become aware of a certain component or aspect of our vehicles that doesn’t meet our strict standards we will take appropriate action, as we have done in this instance. Example related stories From the development of sustainable vehicles and making manufacturing plants sustainable to vehicle recycling, "eco-driving" educational programs and reforestation, Toyota is actively engaged in a wide variety of programs to improve the environment. 8 things you didn't know about Hybrid For some people, Hybrid technology still is thought of as new technology. In fact, even though our first Hybrid, the Prius, was on the roads ahead of its time in 1997, we’ve actually been honing our Hybrid know-how since the mid 1970s.